The wolf also shall dwell with the lamb. Tales From Dirt Mountain, Part 7. Bullying is in the news a lot these days. It’s nothing new, there was plenty of bullying going on at Maynard County High School when Earl and I were there. Like the time I got in a fight with Henry Maynard, descendant of our county’s namesake and notorious bully. He wanted to borrow my baseball glove. I knew I’d never see it again. If the other kids hadn’t pulled him off of me, I may not be writing this today. And there’s Blaise Robbins, talented at golf and proficient in verbal abuse. Every young golfer in Maynard County has been on the receiving end of at least one of his monologues. It isn’t unusual for high school students to get bullied by other students. But when Serge Wlodarski attended Maynard County High School, he had a bully who wasn’t a student. He was a teacher. Barry Linderman was the football and basketball coach, and taught PE and economics. Money didn’t grow on trees in Maynard County, all the teachers wore multiple hats. Coach Linderman was as country as country gets, and a strict disciplinarian. He was a muscular guy, and he didn’t think much of skinny long haired kids like me and my buddy Earl. Nicknames were common in Maynard County. Earl had recently earned the nickname Big Earl. Coach Linderman had a nickname, one that would surely earn a student a paddling if the coach heard him say it. Barry Linderman was known as Roo Poody. None of the kids in my day knew what the nickname meant. It must have been conferred on him by an earlier student and passed down from class to class. I had a nickname as well, one that I wasn’t particularly thrilled with. Partly because it was an insult. But mostly because it was given to me by Roo Poody. It happened one morning in PE class. There was a statewide initiative to measure the fitness of high school students. We had to go through an exercise regimen and do so many pushups, situps, you get the idea. Each exercise had a target number of repetitions, the school’s score was based on the percentage of students who met the targets. When we got to the chinups, the target was four. Not that bad, but not very easy when your upper arms are no bigger than a rolled up Saturday edition of the Maynard County Clarion. So Serge Wlodarski became Charles Atlas. That would have been a compliment to any of the football players who spent hours lifting weights in the gym. Not for pencil thin Serge. You would catch that in the tone of voice when people used the nickname. No one called me that on the golf course though, not even Blaise Robbins. He was a black belt at verbal abuse. He would never use an insult he didn’t originate. Also, Blaise played at Pin Oaks. I played at Dirt Mountain and only ran across him at tournaments. With rare exceptions like Blaise, golf courses were havens for young Serge. Places where people were judged by their ability, not their popularity, looks, or their parents’ accent. But I couldn’t escape the real world as I walked the halls of Maynard County High School. That year, the school decided to have an intramural flag football tournament. Each PE class would form four teams that would play each other. The best team from each class would go to a playoff. In the other classes, the coach let the kids pick their own teams, and make up their team names. In our class, Roo Poody picked the teams, and the names. The boys he thought were the best athletes went on one team. The average kids made up the next two teams. The fourth team was all the leftovers. The kids with long hair, skinny kids, all of the outcasts. He named us the Hippy Freaks. But Roo wasn’t as good a judge of talent as he thought. It turns out there were some pretty good athletes on the Hippy Freaks. For example, Earl could catch any football thrown in his general direction. Once I saw him get tangled up with a defender, as he fell to the ground he caught the football between his forearm and belly for a no hands catch. I was a good safety. Being skinny helps you be quick, and I had a knack for breaking up passes. At 6’2” and 155 pounds, I surprised a lot of people on a basketball court. Ever heard of Manute Bol? That was me, only older, shorter and whiter. It must have rankled Roo quite a bit when he realized that the Hippy Freaks had a chance to make it to the playoff, if we won the last game. We were playing against the Raiders, his handpicked team.The score was tied at 28, the clock was running out, and the Raiders had the ball. I came up to the line to cover Jamey Wilson, he was their best receiver. The call was a sideline pass, and I timed it perfectly. I stepped in front of Jamey, caught the ball, and ran it in for a touchdown. The Hippy Freaks were going to the playoffs. Except for one thing. Roo was the coach, the referee, the time keeper, and the maker of rules. He decided to make a substitution. Roo Poody was the new quarterback. He didn’t put on a flag belt like the rest of us wore, the kind with two fabric straps, or flags, that hung by metal snaps on each hip. He took a flag, wrapped it around his wallet, put it in his back pocket, and fastened the button on the pocket. Roo made the rules, and he had decided which team was going to win. As the center snapped the ball, and Coach Barry Linderman started running down the field, something else became apparent to me. He wasn’t just going to score a touchdown to tie up the game. He wanted to run right over Charles Atlas. From the second he took the snap, his eyes locked with mine. I froze in place. I usually thought pretty quick on the football field, but this was uncharted territory. Survival instincts being what they are, at the last moment I dodged to the right. As I was falling, I instinctively reached out my left hand and grabbed the flag, secured in Roo’s back pocket. It is true that I was, and am to this day, built like a broom. I wouldn’t have lasted very long in an arm wrestling contest with Roo Poody. But even skinny golfers develop strong forearms. The button on the pocket of Coach Linderman’s pants was no match for Charles Atlas. It popped off, the wallet came out. Wallet, money and pieces of paper fluttered in different directions to the ground. In movies, they do these kinds of scenes in slow motion. While the wallet and its contents were slowly making their way to the ground, there would have been silence. Then, as soon as the wallet bounced once on the ground, and came to a stop, the sound and normal speed would resume. I never went to his office. Nothing was ever said about the incident again. I assumed I was done with Roo Poody. That was not the case. It was next spring, and time for golf team tryouts. Imagine my surprise, when I show up at Pin Oaks Country Club, and find out that Roo is going to be one of my playing partners. The story I got later, was that when he saw my name on the tryout list, he went ballistic. According to him, there was no way that skinny long haired punk could play golf well enough to make the team. Unless I cheated, something he had already accused me of doing. So he was going to keep an eye on me, and maybe he thought he could show me a thing or two about golf. He had no idea I had spent every free minute of the last four years either pounding balls on the range, chipping and putting on the practice green, or out on the course at Dirt Mountain. Charles Atlas couldn’t do five chinups, but he would eventually get to a four handicap, and was a seven at the time. Nothing to brag about, but better than the average high school PE coach, and good enough to make the team. When I said I spent every free minute at Dirt Mountain, I wasn’t just talking about when the weather was nice. For four years, after school and on weekends, in the cold, in the heat, in the rain, in the wind, Earl and I played golf as close to 365 days a year as possible. George told us he would ban us from the course if he caught us playing during lightning. Any time there was so much rain that the greens were flooded, we’d have to wait in the pro shop until it stopped and the course drained a bit. And we figured out you couldn’t play when the ground was frozen solid, that was a good way to break a wrist. Aside from extreme weather, and other events that intruded from real life, we lived on that golf course. The weather in late march in southern Georgia is usually fairly warm. But a cold front had come down from the north and it ran into a warm front moving up from the Gulf of Mexico. Which meant that on that day, when Roo and I were playing partners, the temperature was in the low 40s. It was windy, and it was damp. When I met Roo on the first tee, he had several layers of clothes on under his blue Maynard County Falcons windbreaker. And a Falcons wool cap. Every golfer on the course was bundled up like it was the middle of winter. Except for Serge Wlodarski. Earl and I had played more rounds of golf than we could remember in weather much worse than this. I wore a wool cap, and a windbreaker on top of a short sleeve golf shirt. I took off the windbreaker to hit my shots. If you play golf in cold weather, you will figure out that clothing can be very restrictive to the swing. The way to generate power is to make the clubhead travel as fast as possible for as long a distance as possible. Every layer of clothing you add makes the swing slower, shorter and less reliable. When I took off my jacket on the first tee, Roo had a surprised look on his face. It got even more surprised when I poked the ball a pretty good distance down the fairway. I bogeyed the first hole, but parred the next three. Roo wasn’t talking much. He didn’t call me Charles. By the time we made it to the 18th tee, I was 8 over par. Golf courses often save the worst for last, and Pin Oaks was no exception. Number 18 was a long, uphill dogleg to the right. You couldn’t see the green from the fairway, only the top of the flag. The green was large and had two levels. That day, the flag was on the lower left part of the green. I had driven in the fairway, and hit a solid 3 iron that ended up on the back right corner of the green. I would have my trusty Ping Anser in hand for my birdie putt. A 75 foot, downhill, severely breaking putt that also had to traverse the slope between the two levels of the green. Roo tended the flag. I gave it my best stroke, and the ball began its journey down to the lower level. A few feet from the hole, Roo pulled out the flag. 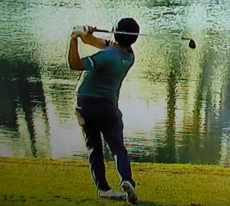 I held my breath as the ball curved toward the destination and rolled in the right side of the cup. I had just shot 79 at Pin Oaks, my best score there. With an incredible birdie on the last hole. In terrible weather, in a pressure filled event, in front of a PE coach who hated me. From that point forward, Roo Poody and I were buddies. We were on the same team. My name was Serge, not Charles. At the banquet after the season, he handed me my falcon blue golf letter, shook my hand and slapped me on the back. I didn’t see a lot of Roo after I graduated, but I kept up with him in the papers. His teams won two state championships in basketball, and one in football. After a twenty year career, he had some sort of fallout with the principal, and got fired. Then hired, the next day, by our 2A rival, Winton High. We had beaten Winton four years in a row in football. After hiring Roo, they beat us four years in a row. He won two state championships at Winton before he retired. Each morning when I walk in the office, my assistant hands me today’s schedule. One day, I see: 9 am, Barry Linderman--will, living will, power of attorney. The muscles had sagged a little, the hair was thin and gray, but I didn’t have any trouble recognizing Roo Poody when he walked into my office. We caught up on news, then proceeded to the legal documents. Standard stuff, the wife gets everything unless she predeceases, then fifty/fifty to the kids. No extraordinary life support, and so on. When we were finished, he stood and asked how much he owed me. I said, “$400, you can either leave a check with Rose or we’ll bill you.” He grinned and said, “Why don’t you have Rose send me a bill for $399. Here’s a down payment, Charles.” He handed me a wrinkled one dollar bill, with the usual portrait of George Washington on the front, and a size 10 Adidas footprint on the back. Of all the stories in the series, this one is the most true. Roo Poody is real, and he’s got a bunch of state championships to prove it. I am not an attorney, the last part I made up. I loved the ending! That was so touching... after all these years he held onto the $1 bill :) At first i really disliked Roo, but then he started to grow on me :) I really enjoyed this chapter. Thanks. You've read all the Tales From Dirt Mountain I've published. But I've got two more ready for editing and another I'm writing, stay tuned.